This was the stage that was cut to 40km because of snow on the Col d'Iseran. Bjarne Riis had just attacked going over the top of the Col de Montgenevre, blowing the field apart. 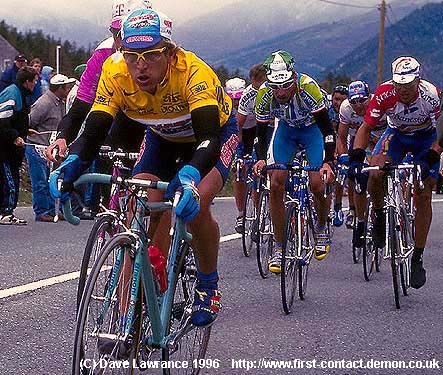 Berzin was about to find out that his stay in the yellow jersey would be short-lived, as Miguel Indurain and Escartin try and hang on. 1997 has seen a dramatic dip in the Russian's form, and I don't think anybody was surprised that he failed so spectacularly in his recent attempt on Chris Boardman's hour record. (19th October 1997).